Where do you usually start with a project? With the yarn, the pattern, or just the feels? Because I honestly do not know why did I make this? I know that I wanted to make a gift for a friend, and the colors of this yarn remind me of her. But because this took me some time to finish, I questioned myself from time to time, why did I pick this pattern for her?!? Or maybe I pick this pattern because it uses Scheepjes Whirl? I find that the gauging of Ashley’s Crochet yarns (as well as other local yarn mixes) are not that far from Scheepjes Whirl. 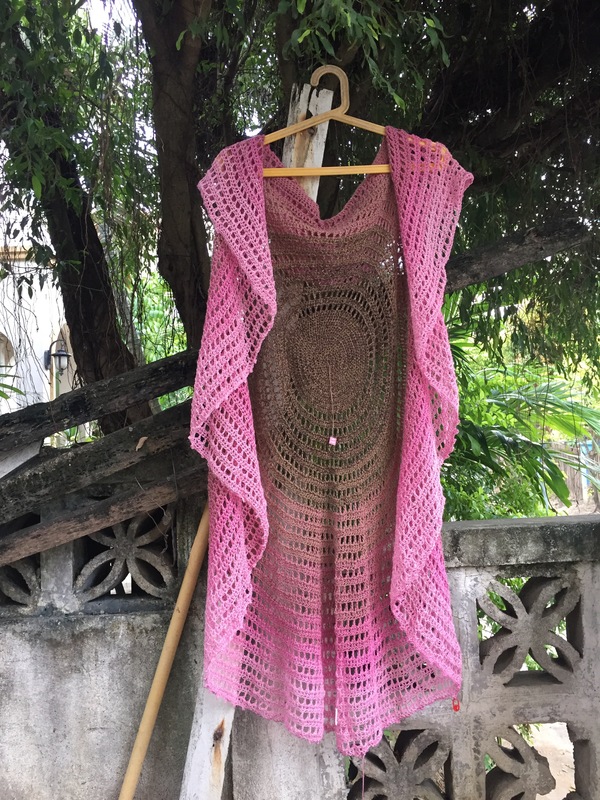 For those who got stuck on what pattern to pick best for local (Philippine) yarn mixes, you can check patterns in Ravelry that are made from Scheepjes Whirl. For this Mandala Cardigan, I think a cotton mix is more ideal, like poly cotton, to give it a stiff to hold the form. 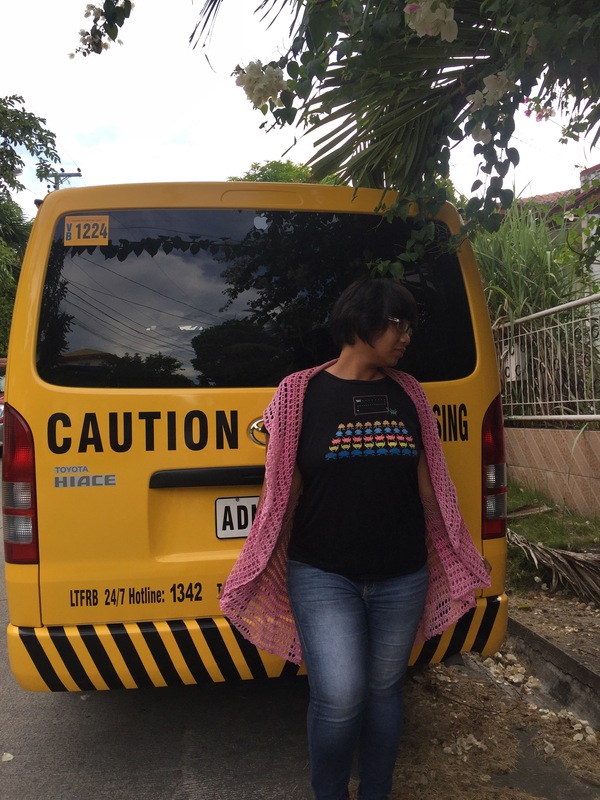 Now for #bloggperpose… This is not mine (unless the friend decided she want another kind of crochet stuff) so I’m trying to hold myself from bloggerposing it. So last week, I decided to abandon all my other WIPs, and just concentrate on the sock business. What I thought was just going to be a 2-day endeavor turned out to be almost 2 weeks; it deserves a lengthy blogpost. Do you resort to not-favorite yarns to do test projects? Well, I do. With this, I used the Robin acrylic yarns, which I think can only be found in Novo stores (Novo is like Unitop). I got mine in Ormoc Novo. But surprisingly, the Robin yarn is lovely to work with. I highly recommend it, especially to new knitters. It is pretty stretchy that will be a big help when your tension gets too tight, which is natural when we’re a beginner. And, I absolutely love the Addi knitting circular needles. I wish I got more different sizes. And, I realized that fixed circular knitting needles are “smoother” to work with compared to interchangeable (or maybe I just did not do it right with interchangeables). I guess I’ll make a different blog post for knitting needles. If you’re totally newbie to knitting and socks (and specifically using circular knitting needles), following is what I did to get a grasp of it. 1. Kelley’s Sock Class >>. It’s a series of video tutorials. I started with the Anatomy of a Sock video to get an overview idea of how socks are formed. 2. The Spruce: Practice Lesson: Learn to Knit a Small Sock. My mistake when I started to make a sock was that I went straight to adult sizes. The ripping usually happens when you reached the “Turning the Heel,” so there’s already quite a work done so it’s making me cray-cray after doing it countless times. By the way, this uses DPNs (Double-pointed needles) and not circulars so there’s a bit of figuring it out. But this is one of the detailed photo tutorials, which is a big plus for me since I’m not really a big video tutorial fan. Sorry, it’s not the video; it’s I. 3. Kelley’s Sock Class – Heel Turn. In connection with number 2, I love Kelley’s explanation on how Heel Turn is constructed; it gives you idea on how to modify it. For a more straightforward video tutorial, I also like Knit Purl Hunter’s Turn Heel (Magic Loop) >>. 4. Knit Purl Hunter: Sock Gusset (Magic Loop) >>. After the Heel Turn part, the sock gusset may look intimidating but it’s not really. Though, there’s a part in here that I’m still trying to find a better way of doing it. I can’t explain it but for the mean time, this works for me. Once you slay this part, everything will be a breeze after. 5. KNITFreedom – Russian Grafting: How To Join Live Stitches With A Crochet Hook >>. To close the socks at the toe, I used this method. Though the most common is Kitchener stitch, but it’s tad overkill for a beginner. But the best Kitchener stitch explanation is from Kelley’s too, Kelley’s Sock Class – Kitchener Stitch >>. She made it pretty easy to follow. Rose City Rollers. A lot would recommend Easy Peasy Socks for First-Timers >>, but I prefer how City Rose Rollers does its Heel Flap, which makes picking up the stitches for the “gusset” easier. Also, City Rose Rollers does the “gusset” part the same with how Kelley’s Sock Class does it. It also provides 2 options for the Toe decrease. I would suggest to go with the “Rounded Toe;” it looks prettier. Also I modified the “cuff” part of Rose City Rollers, I ribbed whilst the Rose City Roller is stockinette. So I used the “cuff” part of Easy Peasy Socks pattern then switch to Rose City Rollers until the end. Yes, the Robin acrylic yarn feels good actually. I wish I would chance on a lot of stocks when I go to Novo. And most of all, ENJOY the journey! Socks are quite handy to tag along any where.